Dan Rowan recounts the horrific day 17 years ago, and how he's coped ever since. MARANA, Ariz. — Tuesday marks the 17th anniversary of the deadliest terrorist attack on American soil: 9/11. 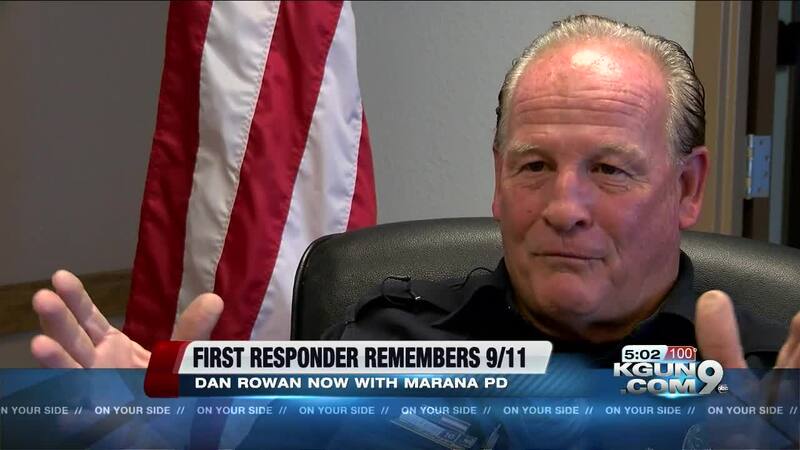 One of the first responders that day is now a Marana Police officer in Arizona. "I don't like to call it Ground Zero, I like to call it Ground Hero. Because that's what we did that day," Dan Rowan said. September 11, 2001 is a day that has stayed with Rowan ever since. At the time, he was a firefighter for the New York Fire Department. He was off duty when a plane stuck the first tower. He grabbed his gear and joined the first rescue crews at the World Trade Center. "Very, very sad," Rowan said. "But you have to do what you have to do. Us as fire, police, EMS, people don't realize when people run out, we run in. It's from the heart, you know, you don't really think of the consequences." Most of Rowan's crew did not survive. He spent the next 72 hours sifting through the debris, looking for the 10 firefighters. "You find things that you really can't say [on air]. Of people... you know, just remnants of people. And you have to do what you have to do. You walk over things to look for your team," Rowan said. He found the remains of a few of his crew. Rowan retired from FDNY January 2004. He's now a Marana Police officer and wears the number 343 on his uniform every day -- the number of New York firefighters who lost their lives on 9/11. "Out of the 343 that passed away that day, I worked with or trained 53 of them. That's a tremendous number," Rowan said. Rowan keeps his fallen teammates and friends close to his heart, their pictures stay in his shirt pocket. His FDNY uniform is in the trunk of his police car. He says the images surrounding that horrific day remain with him every day. "My September 11 is daily," Rowan said. "Every day I wake up, I thank God. But I think: 9/11. Every time I put the uniform on, every time I pop the trunk, I'm seeing my gear from 9/11. Every time I change my shirt, which is daily, and take my team out and put it into another shirt. I live it daily."